Burdock, Arctium lappa, is also known as Gobo, Great Burdock and Niu-bang. An ingredient of the Essaic formula. Esteemed as a vegetable in macrobiotic and oriental cooking. Traditional use of the roots as a blood cleanser in the treatment of acne, gout, fungal skin infections and the symptoms of pre-menstrual tension. Leaves used in a poultice to treat burns, wounds and other skin problems. Also used as a remedy for baldness by Paracelsus. Seed heads utilised in dried flower arrangements. Burdock is indigenous to Europe and North Asia and is adaptable to most soils and prefers an open, sunny position. Frost resistant but drought tender. A biennial plant, growing to 1.5m x 1m. 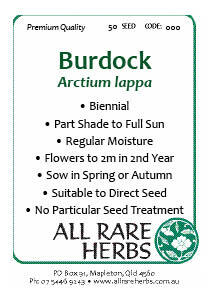 Be the first to review “Burdock, seed” Click here to cancel reply.